Mississippi may be near the bottom on some prestigious lists of states, but when it comes to the great outdoors it is a top-level paradise. One example is the great riding opportunities found throughout the state. 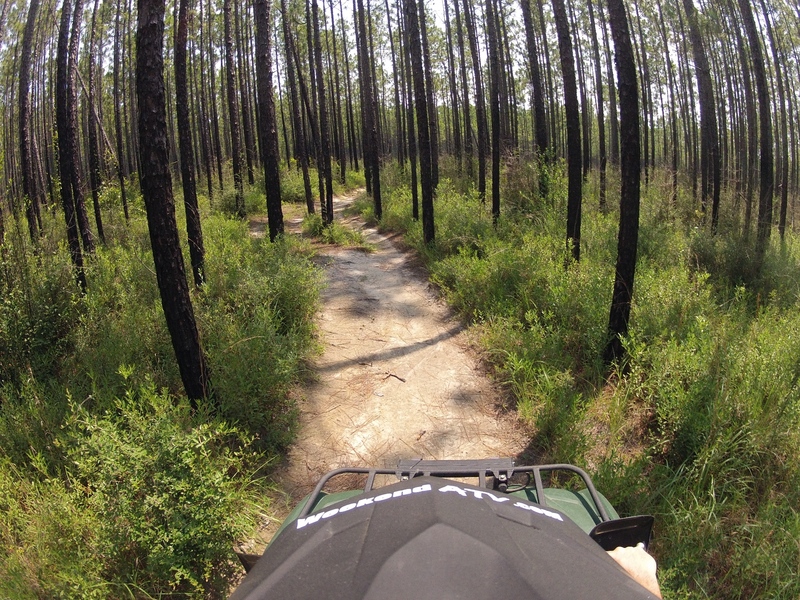 One of the most south-eastern options is the Bethel ATV Trail in Desoto National Forest. 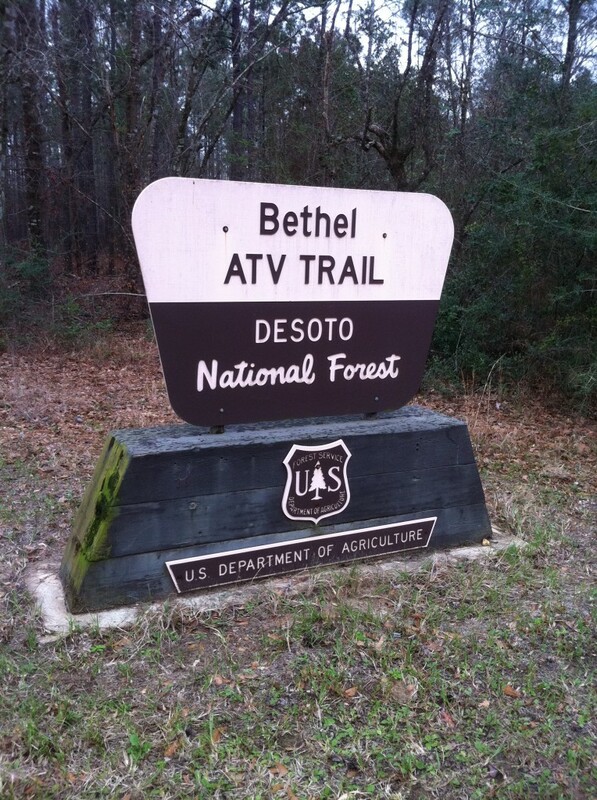 Bethel ATV Trail is one of two ATV trails found in Desoto National Forest. As such, the trails are overseen by the US Forestry Department. The trailhead is not staffed but there is a $5 per person entry fee on an honor system. $5 is more than reasonable for the ride. The staging area is found at the end of a long, dirt road. There is plenty of parking and a primitive camping area with room for RVs. There is also a bathroom at the staging area though it’s really more of a nice outhouse. 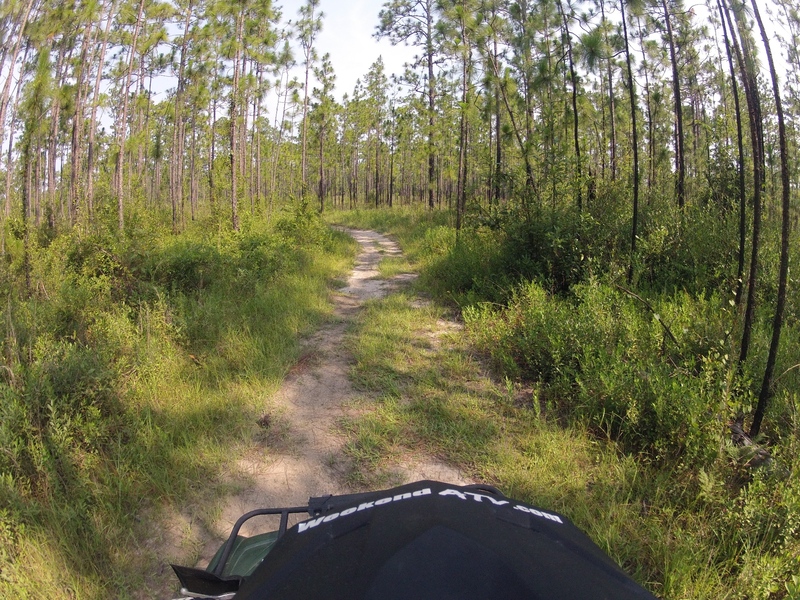 Bethel consists of two separate ATV trails. The north trail is an 18 mile loop and the south trail is a 19 mile loop. For the most part the trails are wide open and fairly amateur in difficulty. This is a nice place for a ride but you likely won’t be challenged. You also aren’t likely to get very muddy, but it does get very dusty when dry. Bring googles (always!) and a change of clothes unless you are at the front of the group. There is a thick pine forest section on the South trail that leaves only about 48 inches of width. Our Suzuki KingQuad 500AXi scraped both side trying to squeeze between trees a few times. Wide ATV’s and UTVs are definitely not going to work here. Side by sides might be okay on the North trail. The trails are quite bumpy and covered with shallow roots. It’s a great place to dial in your suspension. Some sections of the trail are quite sandy and some have rock that has been brought in to prevent washouts. You are highly encouraged to “call before you haul” as the park is usually closed for several days following rain. The trail does not close during hunting season, but it is recommended that you ride on Sunday’s as there is no hunting allowed then. You can get the most current park status 24 hours a day by calling the Desoto Ranger District Recreation Office at 601-528-6180 or 601-928-5291 . 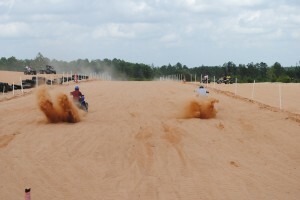 Sand Hill ATV Park is no longer open to the public. Check back here for updates. Most people probably think that with beaches so close there must be a lot of good sand riding around the Gulf Coast. Truth is, there’s very little ridable sand in the South. In fact, the only beach that is open to public riding is Daytona Beach in Florida, which strictly abides by a 10 mph speed limit. So when the staff at WeekendATV.com found out there was a little piece of the West Coast not far away, we planned a weekend long excursion for the entire crew and their families. Our destination was Sand Hill ATV Park, located in Perkinston, Mississippi, an hour north of Gulfport and two hours south of Jackson. The park is in close proximity to Desoto National Forest. Riding starts at 9am and goes till dark on the weekends and holidays. Campers generally arrive on Fridays, but the park will open any day of the week for large groups or those staying overnight. 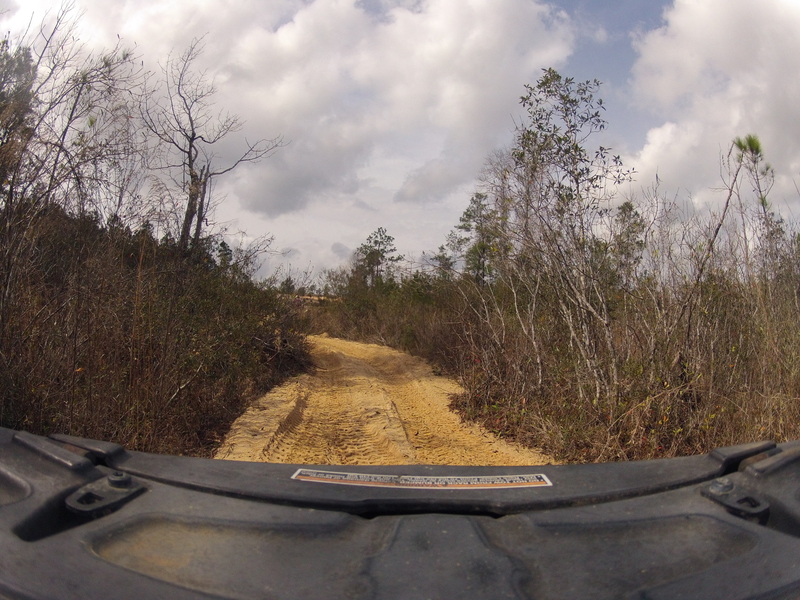 Park prices are $20 per off-road vehicle, $10 for those under 100cc’s. Additional days are half price. There is no charge for passengers. Chances are likely that you will be greeted and briefed by the park manager upon check-in. He or another staff member will review the rules, explain the layout of the land, and fill you in on “must see” hot spots in the park. A complete list of rules can be found at http://sandhillatv.com/Rules.html. 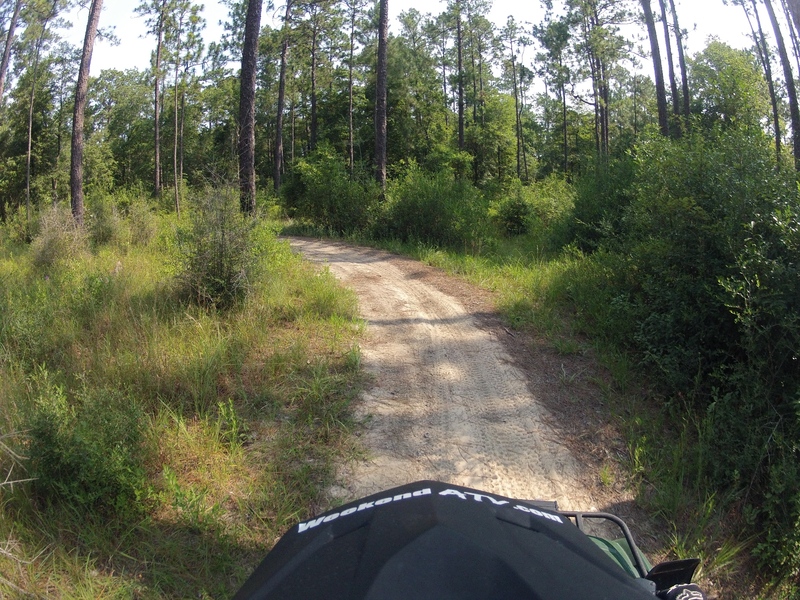 Sand Hill ATV has several options for overnight stay. There’s plenty of room for primitive camping as well as many 30AMP RV locations. In addition, Sand Hill has several cabins equipped to sleep 6 people each. These cabins are basic, but include shower and bathroom facilities, a small kitchenette, linens and towels. If you are traveling with a larger group, you may wish to stay in the “Big House” which is also located on site. Despite being a rustic older home, it fits in well with a destination dedicated to getting dirty. The “Big House” features two bedrooms, one bathroom, sitting and dining rooms, full kitchen, washer and dryer, linens and towels, and a private above-ground pool. Whether camping or simply visiting for the day, everyone has access to the bathhouse that houses multiples showers and a washer/dryer. There’s also a separate above-ground pool for all campers. Food is available onsite at The Oasis, where the Sand Hill staff prepares a variety of burgers, hot dogs, and snacks. Restaurants, fuel and other stores are 7 miles away in nearby Wiggins. 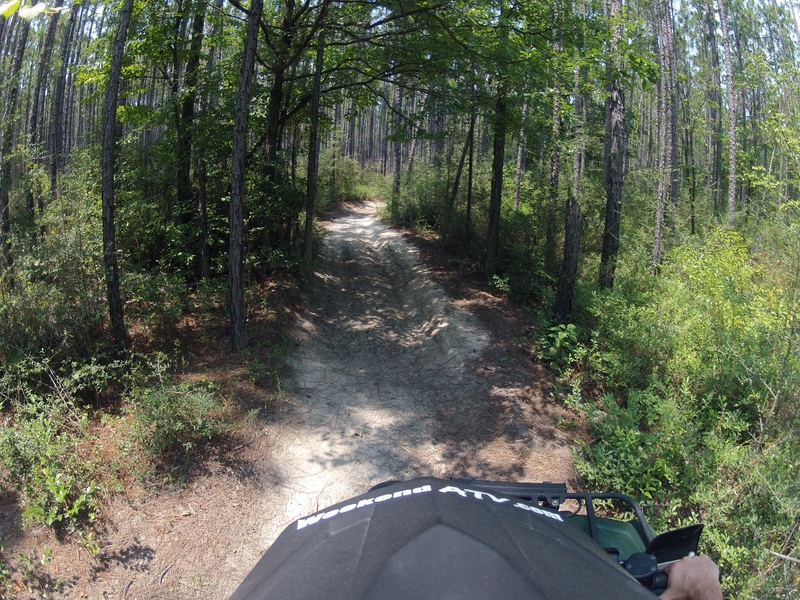 Sand Hill ATV truly has a riding environment for every kind of rider on its 350+ acres. There are wide open meadows and dirt roads perfect for young riders. There is mud almost deep enough to necessitate the use of a snorkel, as well as tightly wooded trails. But most abundant of all, there is sand, and lots of it. The park is setup with several different riding areas all connected by roads and trails. The park centers around an old sand and gravel pit. 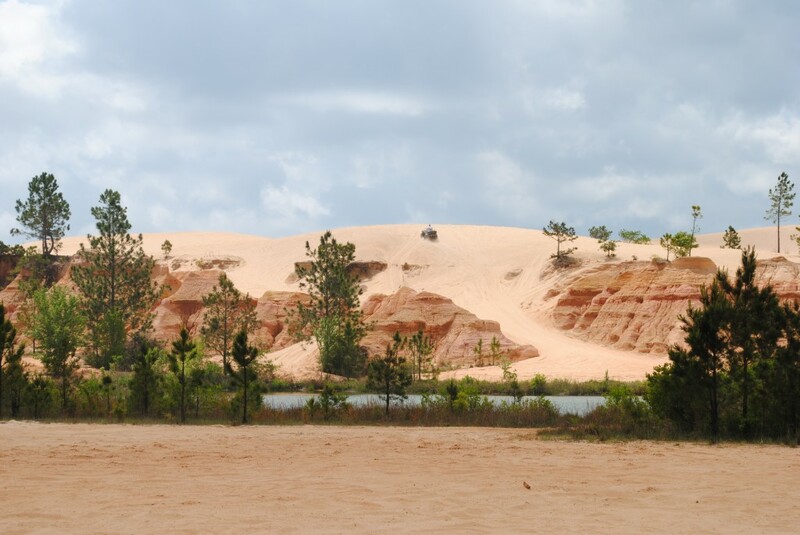 Center stage of the park is a massive sand hill, and assuming your ATV can make it to the top, you’ll enjoy a great view of the park. The hill is surrounded by sand dunes and Arizona-esque drop-offs. Faint tread marks run up some hillsides where brave pioneers have ventured up (or down) paths less traveled. Other areas of the park have steep bluffs of soft sand that will also challenge most machines, especially those without sand tires. The trails are wide enough to accommodate almost everything from a sport quad to a dune buggy or side by side. Just down from the staging area you see one of the park’s highlights: a 300′ drag strip. 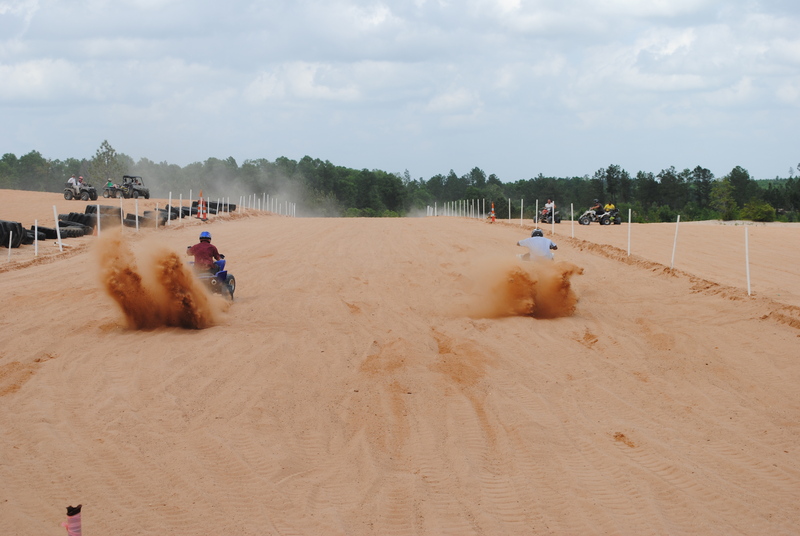 The drag strip is a great place to play around and there are usually a few sport ATVs there to put on a show. Helmets are required on the strip and it is groomed regularly. Throughout the park are various springs, creeks and spillways running between the ponds and beyond. They are navigable enough to be used as trails themselves in several places, though be prepared for the occasional pocket of shallow quicksand that can make for some excitement. On the other hand, the pond is quite deep and can facilitate a great show by those brave enough to attempt skimming across it. If you like mud, Sand Hill has that too, just make sure your ride has aggressive treads and probably a tow rope or winch. 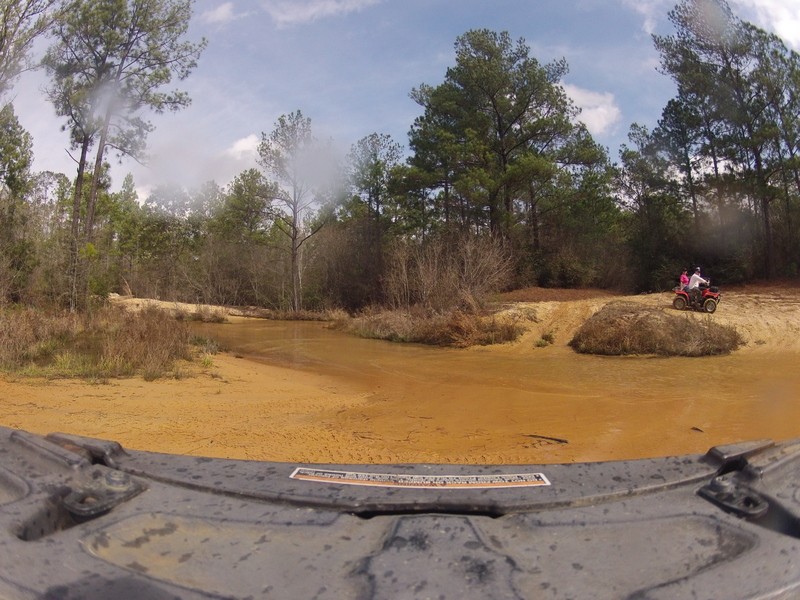 Overall, Sand Hill ATV Park offers the setting for excellent family riding and beautiful scenery rarely found in the Southeast. If you find yourself anywhere near it this is a must visit park. Even if you don’t have sand tires you will still have a great time. To find out more information call Jeff at 601-528-4284 or email management@sandhillatv.com. Their website is available at http://www.sandhillatv.com.